The pace of technology evolution will continue to accelerate in the years to come & so will the increasing threat from cyber-attacks. The consequences of these attacks are detracting at the least and incapacitating at the worst. Security breaches can not only cause immense financial losses but also lead to irreparable loss of credibility, which is perhaps the most important asset for any business. Timely identification and mitigation of security risks are highly critical for the integrity and reliability of any system. It is also a key requirement within industry related standards and regulations such as PCI, HIPAA. At ZenQ, we adopt an end-to-end comprehensive security testing approach from information congregation to result in reporting for uncovering the vulnerabilities, mitigating the security risks and enhancing the security posture of the applications and products. Based on the client’s requirements, we provide flexible and efficient testing services at various stages of a secure development lifecycle. Customized approach to address compliance requirements of PCI DSS, HIPAA, SOX, ISO27001, etc. 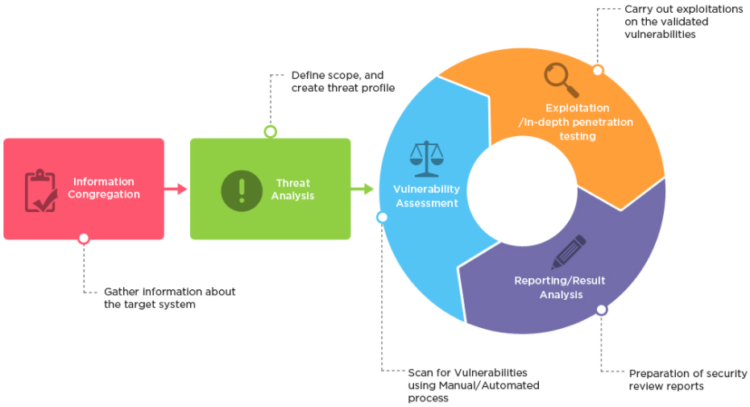 Read this white paper that describes the methodology that we adopt for security testing projects to detect vulnerabilities & enhance the security posture of client applications.